This is my earliest piece from the Cuba series... 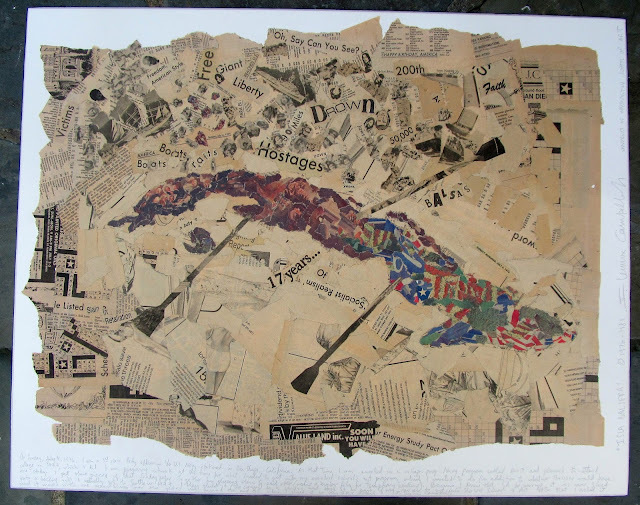 I started it in 1976 (and used it in my portfolio to get into Art school at Washington)... it's a collage... I refined it at collage class with Jacob Lawrence (he used to teach at Washington). It's in the collection of a major Cuban-American collector in New Jersey. I created it using the Bicentennial Edition of the San Diego Tribune, published on July 4, 1976 (I was in the US Navy stationed in San Diego at the time). "Isla Balsera (Raft Island)" - Happy Birthday America, Wishing We Were There! With the rise of speculative collectors cashing in on younger artists—many of them just out of school—whose work is made cheaply and en masse, and resold at a significant profit, there has also been a hyper-professionalization of the role of the emerging artist himself. (My choice of pronoun is not by default: the artist in question is almost invariably male—the gender imbalance in the art market is on full view in this trend.) He has business cards, printed on fine paper stock. His website is pristine. His CV is extensive, and correctly formatted. He may have even hired a Hollywood agent. And yet the art market has refocused his goals toward short-lived commercial success rather than a career. Must read article by Daniel S. Palmer here. Switzerland’s MCH Group, the company that owns Art Basel, announced on Friday that it will expand further into the art market with a new initiative focused on regional art fairs.